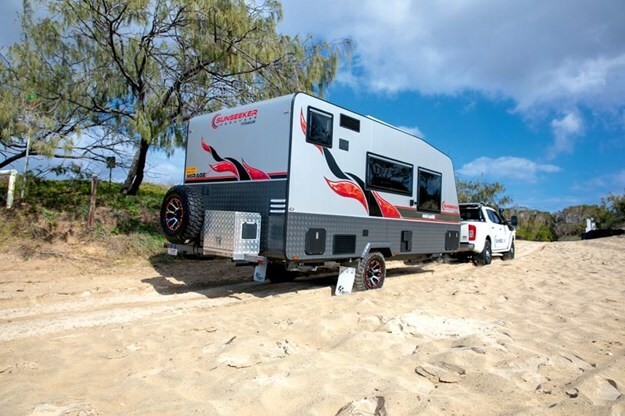 We spent a day with the Sunseeker Mirage Sport 17’6 on Noosa’s northern heads, a great day-camping spot with plenty of opportunity to find a bit of beach for yourselves. We chose that location as it also gave us a chance to test the Mirage Sport's suspension as well as checking its clearance in soft sand and to avoid the damage rocks can do. 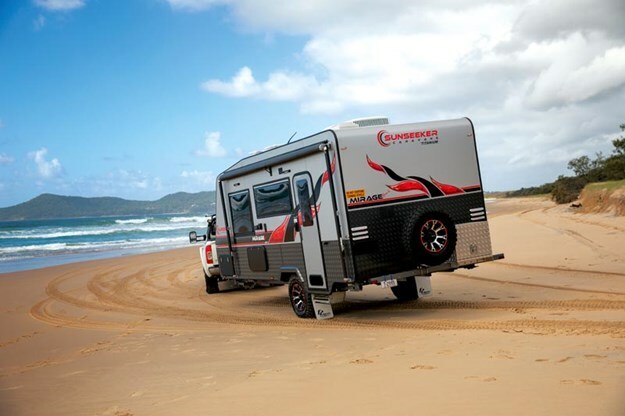 What we came away with was a feeling that the 17’6 was a capable offroader, even for a full-bodied caravan. 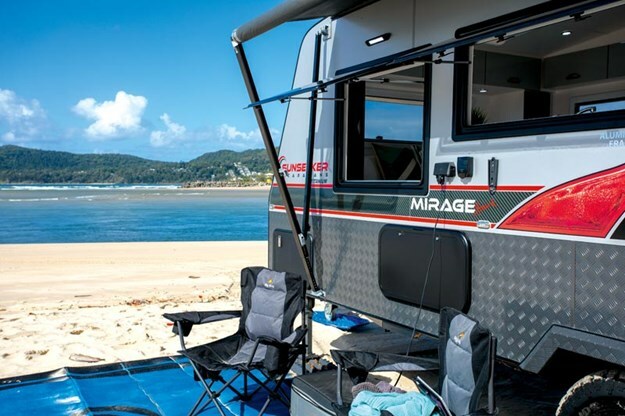 Even though the Mirage Sport 17’6 is a full-bodied van, with no chamfering of the rear overhang and sitting at moderate height, it is still an imposing van with a clear purpose. The external details on the 17’6 are clearly designed with offroading in mind, none more so than the rear chassis design from FP Chassis. Four 50x50mm rails run straight from the main chassis to the rear of the caravan protecting it from damage when dragging it over obstacles. It could, of course, be cut away but the added storage space the traditional box shape provides is always welcome. These rails run out long enough to become the support for the standard gen-set box and spare wheel, both of which are high and set inboard to prevent them from being dragged. I must add, if you're after an offroader, check the spare is not the lowest point at the rear ­— I've seen spares pressed into the body of the van and if something so simple is overlooked, perhaps what you're looking at is not so ‘offroad’. The body of the van is aluminium composite cladding with checkerplate around the most commonly damaged areas, the lower sides, front and rear. Be careful with the topsides though as they will scratch if pushed deep into trees. Underneath, the 17’6 is fairly well thought out. Any plumbing or wiring that has to run under the chassis rails is tucked near some protection, such as the tank drains which hide close to the Roto moulded polyethylene tanks to avoid damage. The freshwater tanks flank the suspension to help balance while the drawbar extends deep under the main chassis acting as a riser. My only complaint here is more of a suggestion and one of personal preference: I would like to see some scrub bars/sliders on the front-most corners to give a little more protection in and out of river beds. Given the long drawbar, this is an area I think could see a bit of damage. Talking to the team at Sunseeker, these are easily added as a custom option. For the 17’6 there are a couple of layout options — buyers can choose from a front door design and the rear door as seen here. 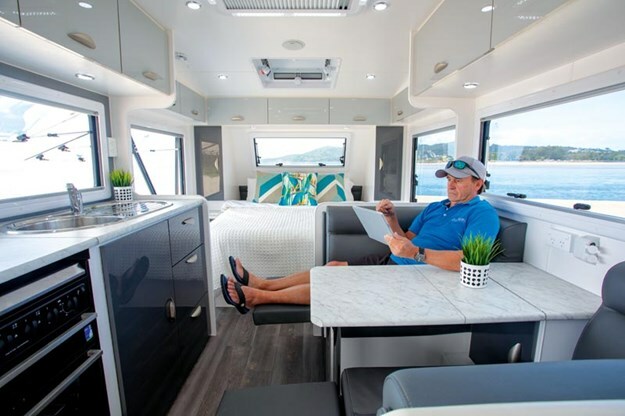 Personally I would go for the rear door as it means guests are not entering directly into your sleeping area, but both feature the same rear ensuite, north-south queen bed and benchtops. The only other changes are the position of the fridge. In the front door option, the fridge ends up beside the main kitchen bench, unlike in this version where it is opposite the entrance. The front door option does offer more space around the bed. From an entertaining perspective, there are big differences in potential usage between the two options, and I’d suggest the rear door layout is much more sociable for any outside guests. Moving from the kitchen to outdoors is a step away and with the wide kitchen windows open, passing a guest a drink or food is simple. 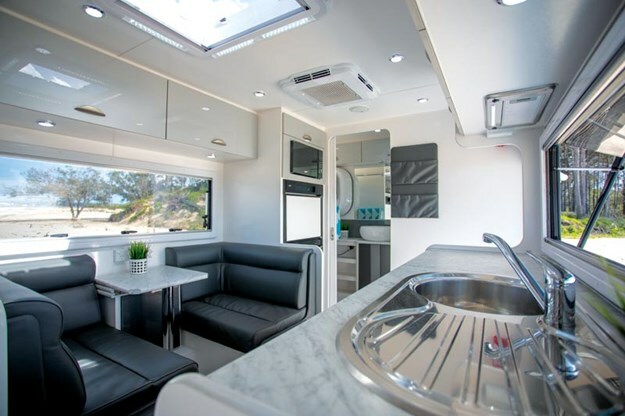 Liveability is good in the 17’6 thanks to some clever additions such as a master light switch above the bed in the centre. It means if you or your loved one drift to sleep, there is no reaching over each other to turn off the bright overhead reading lights. Storage is fairly typical of new caravans with an under-bed area, long robes each side and plenty of cupboards around the bed. I appreciated the use of piano hinges as well as gas struts, as they make the use of the cupboards easier for those of us with arthritic hands. Down in the ensuite and a small gripe surfaces. 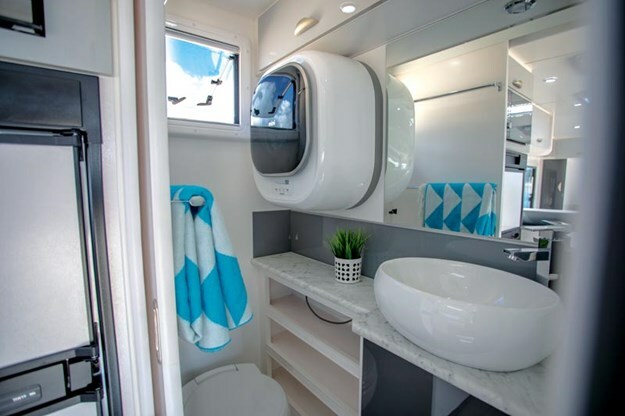 It is an unfair concern considering the overall size of the caravan but the space around the toilet is tight; call it a compromise as the fact there is a separate shower and toilet in a 17’6 is a great achievement. Here you will also find a wall-mounted front loader washing machine. Some people complain about front loaders not being able to be opened when started but I really appreciate not having to bend down to retrieve that lost sock. Give me a wall-mounted front loader any day. Space between the lounge and kitchen is good though it is a bit tight accessing the bed from them. Ceiling height is OK at about 2m. It is my curse in life to be bigger than most so I knocked my head on the reverse cycle air-conditioner a few times but for the bulk of the population, this will never be an issue. Headroom in the shower is only slightly less with the design using a moulded cubicle and through-floor drainage, and ventilation is good. Getting offroad is two-fold — there is getting there and then there is staying there. 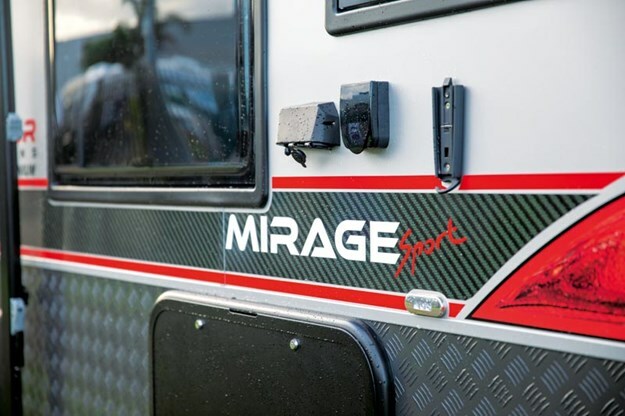 The Mirage Sport, with its AL-KO Enduro Outback suspension, has the articulation and clearance needed to bound most obstacles and with a well-armoured exterior and knobbly tyres, the van will go as far as its owner and tow vehicle permits. You will be limited by enthusiasm before capability and can feel assured in the build by the two-year manufacturer’s warranty and five-year structural warranty. We found it easy to tow, very much so. Single axles are great for turning and backing easily. For an offroader, a heavy duty single is preferred over a twin although tyres must be well monitored for damage, pressure and wear plus a second spare is advisable, as is a good pre-departure checklist. 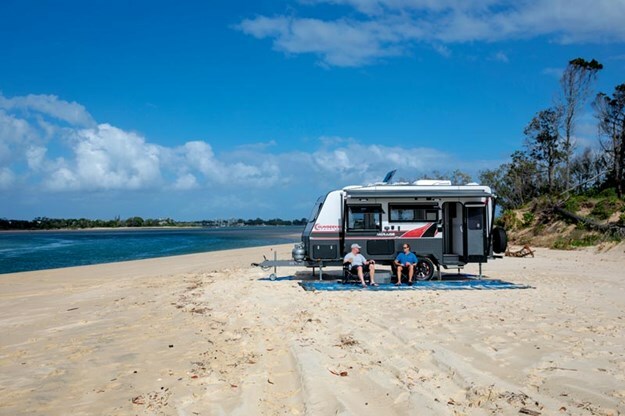 Once at your remote desert oasis or beachside paradise, the 150W solar panel and 120A AGM battery will support normal use easily, weather permitting. Add in some use of an inverter, heavy microwave use or add more 12V refrigeration and you may struggle though. Thankfully the fridge is three-way and with twin 9kg gas bottles, you should see weeks with considerate use of it and the stove. Water wise, the 17’6 has an abundance of fresh water with twin 95L tanks easily monitored via an LED screen in the kitchen. The optional grey water tank is 95L. The one thing you will not be able to do on the built-in goodies alone is run the AC. For that to happen you will need to make use of the standard gen-set box on the rear of the van and fire it up. Personally I am not a big fan of the use of generators around others but when remote, they offer the chance to recharge the AGM and cool off the interior during the hotter months. With a features list that reads like a 20-footer, the Sunseeker Mirage Sport 17’6 belies its diminutive size. Add in the easy maneuverability of its single axle and you get a recipe for a lot of caravan and ability. The localised design and ease of customisation are massive bonuses too.